§1.1. Studies of the early cities and states in southern Mesopotamia proceed in what most of the contemporary world of social and historical scholarship would regard as a curious cocoon. The circumscribed, indeed myopic, viewpoint of scribes and texts, wholly subservient to the beliefs and concerns of ruling authorities, whether secular or priestly, simply ignores the conditions of life of the vast majority. Yet the circularity of allowing the importance and success of research priorities to be largely judged only by direct disclosures of information in the texts is regarded as natural and unproblematic. §1.2. Loving attention is paid by archaeologists to long sequences of overlying changes in palace and temple architecture, seals, and ceramics, implicitly if not explicitly justified by the greater likelihood of finding more textual evidence reinforcing existing patterns of our interest and ignorance in these precincts. What do we know of the probably more profound and consequential changes (cyclical and/or cumulative, in what combination?) in the conditions of mundane life beyond? In its diversity and surely existing degrees of relative wealth and impoverishment, it has received essentially no attention at all. As we look around at conditions in the world we ourselves now occupy, is this not at least slightly embarrassing? §1.3. Even if we confine our attention for a moment to the small minority of literate officials, did they live in sequestered quarters or in randomly located ones amidst the larger population? How much did their different degrees of rank contribute to their styles of life? To what extent was their use of literacy brought home from the office? Similar questions of course apply to skilled craftsmen and merchants, to the entire field of the conditions of work and life of women outside of their often heavily imposed institutional settings of work, and to all lifetrajectories from childhood through old age? And for all of the above, to what degree were there overlaps and differences between the official world and the popular one in belief and value systems? It is extremely unlikely that an absolute barrier could have been maintained between literacy and illiteracy. But it is also unlikely that as knowledge of writing disseminated partially and selectively to new users and uses, it retained more than fragments of the carefully inculcated world-view of the scribal schools. §1.4. Some obvious, external forces help to account for this imbalance. The public’s greater interest in instantly recognizable monuments and valuable relics than in reconstructing the complex conditions of ancient life is certainly a major one. Not a few great public museums encourage this emphasis, nudging it along with their own prestige and patronage. And understandably, it is the primary concern of epigraphers to be faithful to the demanding difficulties of their texts. Doing so naturally concentrates their attention more on the narrow top than the broad bottom of the social hierarchy. Some archaeologists also rightly join them in devoting themselves to political and religious architecture, elite cemeteries, works of art—and, not least, to recovering state archives which happen to be in the same settings. §1.6. Continuities, not oppositions, are what is needed. The whole world of knowledge depends vitally on what can only be recovered from texts. But consider how much is lost if, as is the case at present, finding the degrees of penetration of literacy and elite culture into popular life, and vice versa, fails to assume its rightful place among the highest priorities in ancient Near Eastern studies. Responsibility for finding a better balance obviously requires some external as well as more internal attention. §1.7. I am not concerned in this article with the extraordinary burst of creativity accompanying the origins of record-keeping in the fourth millennium, but rather with its fuller flowering more than a millennium later. It was during the 3rd Dynasty of Ur—hereafter Ur III—that we directly encounter the huge complexity of demands that the technology of writing and its small class of scribal specialists were called upon to meet. And I have chosen to be even more narrowly focused, on the single city of Umma and the province of which it was the capital. §2.1. Umma, with a long antecedent third-millennium history as a politically important center, may have escaped archaeological attention primarily because of its remote and difficult-to-reach, dune-infested environs. Difficult to protect for the same reason, it attracted the early and persistent attention of looters. Efforts began in the later years of the Ba’athi regime to overcome these impediments, cut short by the Gulf War and then by the 2003 American-led invasion. Since then it is likely that the Umma province has again been a major focus of looters’ attention. How soon it will be possible to resume those efforts is uncertain, but in the meantime Umma has nevertheless come to occupy a deservedly important place because of its great repository of cuneiform tablets. §2.2. Intensive looting began early in the last century, in the later years of the Ottoman regime, and by chance quickly struck the apparently central archive of the provincial government. Much must have been broken and discarded in the process, but most of what was retained and exported for sale ultimately found its way into a number of the world’s museums and other public collections. The wheels may grind slowly, but now it may be our single, most comprehensive body of information on the Ur III period. §2.3. This has led to the choice of Umma as a place from which to seek a view “from below,” to the limited degree possible, of the whole of the population, rather than of the much larger imperial structure on which all its written sources concentrate. A great part of the Umma archive is indeed concerned with managing the required labor of Umma’s ordinary population. But this is top-down, authoritarian management, concerned only with requirements and outcomes and reporting essentially nothing on the conditions of life of its subjects except as debits and credits in their units of assigned work. The challenge—one to which archaeology will one day make a major contribution—is to begin to find a way through or around this myopic screen. §2.4. No claim is made that the particular microcosm of Umma is representative of other provinces. In fact, many differences among them are clear, although the systematic study of those differences is still in its infancy. But while the archaeological study of the material remains of Umma and its setting is also in its infancy, there currently is simply no better place to make a beginning. §2.5. It must quickly be added that no such study would be possible without the collective contributions of Sumerologists who have devoted years of study not only to this extraordinary archive but to the much wider range of the Asssyriological corpus that is needed to illuminate its many ambiguities. More particularly, I have been dependent on the ongoing, sympathetic involvement of Piotr Steinkeller, a friend and colleague for many years. We collaborate closely without necessarily agreeing even on some fundamentals. Interdisciplinary scholarship achieves its ends not by requiring consensus at every step but simply by continuing openness to ongoing dialogue. §2.6. Steinkeller, Elizabeth Stone, and I were coorganizers of an interdisciplinary workshop on Ur III Umma at the Oriental Institute in Chicago in February 2007. Beside the organizers, participants included Robert Fernea, Donny George, McGuire Gibson, Cary Hritz, Nicholas Postgate, Stephanie Rost, Benjamin Studevent-Hickman, Tony Wilkinson, Henry Wright, and Rita Wright. Illness prevented the participation of Hans Nissen. We are grateful to the Oriental Institute and the Cotsen Intitute of Archaeology of UCLA for sponsoring and supporting that very unusual meeting. But while the complex and useful exchanges there were a stimulus to this paper, it does not purport to be in any sense a report on the contents of those verbal proceedings and is instead an independent set of further, more detailed explorations and reflections partly stimulated by them. §2.8. In the ancient Near East, writing was for millennia, at least in an officially prescribed sense, a very narrowly held and communicated technology. How well, then, can official archives be thought of as representing the situations and activities, let alone the beliefs and values, of the much larger populations upon whom dynastic rule was imposed? The answer is that we have almost no idea, since the question has received little attention. It demands attention if the very nature and dynamics of all great ancient states and civilizations are to be properly understood. §2.9. Insofar as is yet known, other than for the regular extraction of heavy taxes and burdensome labor services, the monarchical regime resident in Ur involved itself for the most part with the imperial peripheries and only more sporadically and indirectly in the internal affairs of more secure, centrally located provinces like Umma. There were surely some exceptions to this, of which little is generally known. For example, with several score of known offspring of Ur III kings Šulgi and Amar-Suen, whose accession to power was barred by a fraternal line of succession, there was very likely growing royal pressure for other forms of entitlement or preferment applied throughout the empire (Dahl 2007: 31). But textual evidence demonstrates that internal governance in Umma and most other provinces was in any case administered by lines of governors or ensi2 drawn from their own leading families. §2.10. In the absence of available records from archaeological excavations in the Umma province, our direct evidence in seeking to look at the province as a microcosm of the Ur III empire is very largely confined to its archive. Containing on the order of 27,500 known Umma texts currently in the CDLI catalog, it covers only 45 years or so, less than half of the duration of the dynasty—essentially the same span as is known for all other Ur III provinces (Ur itself continues a little longer). In terms of directly contemporary coverage, the sources are entirely silent both on its formative phase under Ur-Nammu and the first two decades of Šulgi and on the last two decades of precipitate decline under Ibbi-Suen. Our view is thus confined to a quite brief middle period. The archive cannot be expected to be very informative about trends of change within the dynasty as a whole. And of course there is irreducible uncertainty as to what exactly the early looters succeeded in finding and passing on to buyers in world markets, and what they may have missed. §2.11. But what of the Umma province itself as a representation of conditions obtaining more generally within the empire? It is usually thought of, first, as part of the of the empire’s relatively placid inner core, reflecting ongoing internal administration with successive, mostly generational changes at many levels but little or nothing of any political or military crises affecting the empire at large (Steinkeller 1987). At a fairly high level of abstraction or generalization that is not inaccurate, but I shall presently question the sweeping uniformity of conditions within the “core” that this view seems to imply. §2.12. There does appear to be a fairly wide consensus that this was the principal archive of the succession of provincial governors. At least thus far (with very little having yet seen the light of day from extensive recent looting), any holdings of lesser offices or the private records of merchants or trade agents kept in their separate offices or held in their homes, other records are not yet available and cannot even be seriously looked for until large-scale work becomes possible in areas of private residences. Hence, there are only indirect clues at best to secular markets and market-places, land ownership, and private wealth, and indeed secular activities of almost any form. §2.13. While ranking immediately behind the Girsu-Lagash province, which lay adjacent to the east and southeast, the Umma province was only a third or fourth of its size and importance in every major respect. Nothing is yet known of where its boundary lay to the northeast, in the direction of the empire’s own frontier, but there is nothing in the archive to suggest that transfrontier interaction was a matter of significant concern. There are about 80 Elamite names referred to in the Umma archive, contrasting with ten times that number in known Girsu-Lagash textual sources, directly adjacent to disputed foreign regions further to the east and northeast (Michalowski n.d.). And there is no reason not to expect that various differences of comparable signifi cance did not exist between Umma and many other imperial provinces. What Umma does incomparably offer us, however, is its comprehensive coverage of the province’s administrative system. §3.1. With a single province rather than the empire as our focus, there is little further to be said about the role of the kings in Ur. Dynastic succesion is given in the glossary at the end of this article. §3.2. What is known of the dynasty’s rule, shrouded in its own self-interested representations (and those of successor dynasties), is widely discussed elsewhere (e.g., Postgate 1992 for a broader, including archaeological, overview; Sallaberger and Westenholz 1999 for a cuneiformist perspective). There are basic questions about the character and extent of its authority, however, that cannot be kept separate from this discussion of the internal affairs of our single province. It may be best to take them up at once. §3.3. It is uncertain, as Jacob Dahl observes, whether Šulgi ever really wrote the set of “reforms” often attributed to him. Yet there seems little doubt that he at least “aimed, increasingly, at embracing all aspects of society; whether ownership of the entire state had been transferred to Šulgi is not clear but possible” (Dahl 2007: 15-16). A recent, succinct, and very thoughtful review of Šulgi’s wide-ranging impacts underlines their formative quality (Michalowski 2008:38). Clearly arising here is the question of the dynasty’s major figure’s aspirations for command-and-control, on the one hand, and ability to exercise it over his subjects without limit—or even to perceive the limitations of his efforts—on the other. §3.4. Was it or was it not an embracing feature of the Ur III Dynasty that it had some meaningful level of absolute control over all the land and population of the “inner core” of the empire it proclaimed? Piotr Steinkeller’s comprehensive knowledge of the texts from Umma and other major urban archives leads him to believe, first, that the province was both densely and quite uniformly settled, and, secondly, that most of the province’s territory was under direct royal control through royally appointed generals (šaginas) rather than under the ensi2-governor’s jurisdiction. Specifically, he argues that “at least two-thirds of Umma’s rural population were members of the royal sector” (2007: 209). At the Chicago workshop he observed that his interpretation, while not readily observable in texts from the province’s institutional sector, was in fact plentiful in many other kinds of sources, and went on to suggest that most of the royally controlled lands and settlements lay in the two southern quarters of the province, Guedina and Mušbiana. There he expects “many” major royal centers must still remain to be found and identified. §3.5. This position, it should be noted, has been met with doubt by some of his Assyriological colleagues. Jacob Dahl, in particular, whose work deals comprehensively with much of the same archival literature, writes instead that “the districts of Guedina and Mušbiana, often grouped together, were perhaps without any large permanent settlements.” (2007: 34-35; cf. Van Driel 2000: 12). I leave the details of this disagreement over textual references to the textual specialists, beyond noting that in any case we await Steinkeller’s full presentation of his evidence. §3.6. At another level, however, the absence of unambiguous evidence in the provincial archive for a parallel and larger royal domain virtually enveloping it is certainly puzzling, inasmuch as royal personnel were present within the ensi2’s jurisdiction in some numbers (Dahl 2007: 56, 57) . Would not this royal domain within the Umma province have had to be no less productive of decisions and documents than the provincial one? Could two such large bodies have existed side by side without being involved in a steady flow of intercommunication? §3.7. ensi2 and šagina, the administrators of the provincial and royal domains in Ur III provinces, respectively, were both high officials. ensi2 had roots of familial authority, extending back into older, pre-Ur III city-states. The appointment of šagina reflected closer, sometimes in fact familial, ties to the dynasty in Ur. They were often involved in activities calling for ad hoc inter-provincial authority, and particularly for military leadership. The question that is relevant here is whether the coexistence of the two titles implies the coexistence of separate, parallel structures of governance, reaching down in both cases to incorporate and control their own landed sectors of the province and its inhabitants. §3.8. While we cannot take for granted that Ur III lines of communication were straightforward and unblocked, I feel provisionally justified in doing so here unless Steinkeller presently produces convincing evidence to the contrary. On the whole, non-communicating networks of administration, while very largely overlapping in geographic and substantive areas of responsibility, seem seriously unwieldy and conflictive. Inherently more likely would be an informal differentiation of their primary functions only at the level of their own titles and positions. Thus, the šagina would exercise authority emanating from his military responsibilities, and in other respects reflecting the fact that a direct royal appointment associated him with carrying out specific royal priorities. The ensi2, on the other hand, was burdened with all the continuing complexities of civic administration. There exists a sealed document (confirming that) Šu-Mamitum, the mayor (hazannu) of Maškan (received), on behalf of Puzur-X, the general of Maškan, from Ur-Lisi, the governor of Umma, as a barley-loan, 504 gur (ca. 150,000 liters) of barley (according to) the royal (measure), for 840 dependent workers, acting as erin2, at the rate of 3 barig (ca. 180 liters) each. Ekibi, the messenger, was the ‘enforcer’. Month: “sowing,” year: “Anšan was destroyed” (Šulgi 34 vi, Umma calendar). §4.2. To Steinkeller, while acknowledging ambiguities, this indicated that the population involved fell under full royal control. Respecting his authority as a leading Sumerologist, I still come to another conclusion. Maškan was a known town of considerable size under its own mayor. A šagina of Maškan certainly plays a prominent role in the recorded transaction. But the ensi2’s loan was made not to but on behalf of the šagina, and directly to the mayor. Steinkeller tells us elsewhere that hazannu “were in reality elements of the rural social organization,” and this position “though not a member of the military organization sensu stricto, fell under the authority of the local military commander, rather than of the governor of the province” (Steinkeller 2007: 203, 209). But does anything more than the formal presence of a šagina, perhaps merely lending his good offices as a royally appointed officer whose primary responsibility lay with a garrison located in or near Maškan, bring Maškan under some comprehensively and distinctly royal form of administration? After all, it was the 840 men of Maškan themselves, rather than the šagina, who surely would have had to pay off the loan. §4.3. Nothing indicates that this šagina had at his disposal a supporting administrative staff of any kind, or resources comparable to what the ensi2 was providing. As far as can be seen, he may have had only a territorially very limited sphere of authority. Nor does anything formally establish (although of course it may imply) a subordinate relationship of the hazannu to this šagina. How would it happen that 840 erin2 simultaneously needed barley (as rations or for seed?) in such a place? Might it be a new settlement in formation, possibly of immigrants? And should we assume, as Steinkeller believes, that the 840 erin2 of Maškan were an im-ria, which he describes as “a unit of military settlers … with some sense of common descent (real or fictional)” (Steinkeller 2007: 209). It certainly is possible that theirs was at one time at least a quasi-military unit. But nothing establishes that these 840 erin2 had any military responsibilities at the time of the loan, or that they were in any way distinguishable from ordinary farmers. §4.4. Why should we characterize im-ri-a, in their full context, as being military units at all? Thorkild Jacobsen and Benno Landsberger, it may be noted, each earlier proposed the simple translation of “clan” for imria (Gelb 1979: 94). Is it not inherently much more probable that im-ri-a were in essence deeply traditional, solidary groups of mainly country people, their kin ties partly real and partly an outgrowth of long proximity in a neighborhood, with an internal structure and shared set of interests and values strong enough to make them durable and effective? §4.5. What would be more natural than for a new dynasty, seeking means to establish its local authority, to give a title to some strategically placed, existing social groups of this kind, with correspondingly vague military or other honorific responsibilities? Having put such a policy in place, lesser administrators would automatically make the military connotations part of their own operating definition of the term. But how far should we allow the state’s altered definition to establish for us the fundamental nature of the im-ri-a themselves? In an interdisciplinary overview such as this one, why should the state’s self-interested act, and its monopoly over representations, force us to not take into account a different interpretation? The weight given to this putative military function really emerges, I believe, from the hopeful view of Ur III administrators that the empire was so all-embracing that there could be no one without an assigned place in it. Asking these questions is a reminder that the administrative records can in no way be regarded as fully representative of the totality of the inhabitants of the area occupied by the province. The characteristics of the im-ri-a appear to me to be exactly what one might expect by way of communal organization out to the southeast of the developed region around the capital of the Umma province, vaguely under the protection and suzerainty of both the ensi2 and the king in distant Ur, but in most respects, most of the time, largely managing its own affairs. §5.1. I must now turn away abruptly from what to some may seem at this point a digression, in order to deal directly with what we know of the material realities of life in Umma. Second only among 19 Ur III provinces to the adjoining, much larger province of Girsu-Lagash, the Umma province is estimated (by Steinkeller) to have been on the order of 2,000 square kilometers in size (say, 40 x 50 kms or 25 x 30 miles), and had for centuries been one of a number of periodically contending city-states that characterized Mesopotamian civilization during most of the third millennia. Now it lay well inside the frontiers of an imperium that had suddenly extended itself in a narrow inner lozenge enhanced by outlying alliances for almost 2,500 kms, from eastern Anatolia far down along the eastern shore of the Persian Gulf (Dahl 2007: 6). §5.2. Most but not all of the wider landscape of the Umma province, lay within the bounds of Adams’ and Nissen’s Warka Survey (1972) four decades ago. But that project was able to penetrate into the Umma province only toward the practical limits of vehicular travel from its base in Uruk/Warka, 40 kms to the southwest. Heavily blanketing the entire region then (and still) were dense, frequently almost impassable dunes. The effectiveness of survey coverage was therefore seriously compromised, limited to the discovery and description of only twenty Ur III sites within the approximate area of the province. Not far north of the dune-belt, which probably had its origins in aeolian erosion of the underlying meander-belt levee of an ancient Tigris branch, survey coverage shortly ceased and was never allowed to resume. §5.3. Four decades produces serious obsolescence in the survey business. Important conceptual and methodological advances in archaeological surveys have taken place, quite apart from technical breakthroughs in image accuracy and quality. They are largely embodied in the important field demonstrations and writings of Tony Wilkinson and his associates (2003, Kouchoukos and Wilkinson 2007). Among other things, he now rightly insisted at the workshop that we take into account statistically the progressively increasing likelihood that smaller sites will escape detection. Further advances in the interpretation of patterns of ancient occupancy are certainly in prospect, even if new fieldwork exploiting them in this region is likely to be long delayed. §5.4. A map of the territory within which the Umma province was situated, its perimeter never given in detail, is shown in figure 1, based on 1:50,000 prints (while the Digital Globe series can sustain much larger-scale, even 1:2000, prints). Its two principal watercourses framing it to the north and west, the Idigna and the Iturungal, were both its crucial resource and its major lifelines of integration. The former, a branch of the ancient Tigris, was of quite secondary size and hence hydrological importance, but played a decisive part in third and early second millennium Mesopotamian history. Its clearly canalized offshoot to the south, the Iturungal, ultimately joined a major branch of the ancient Euphrates not far downstream from ancient Uruk, the better known, largest and earliest of southern Mesopotamia’s cities. South of the Idigna, all the way to the next major network of canalization connecting Uruk, Larsa and Bad Tibira, there was no comparable nexus of waterways. §5.5. 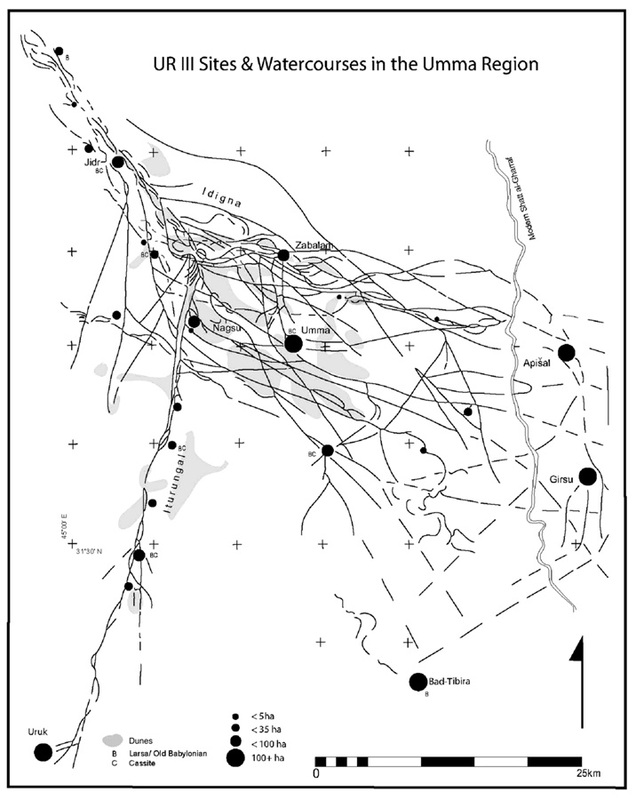 The Iturungal provided a connective link in an enclosing network of natural and artificial watercourses serving the major southern Mesopotamian cities (Steinkeller 2001: 40, map 1). Re-examination of its course and adjoining settlements in connection with preparation of figure 1 confirms that it was apparently constructed either early in the Early Dynastic I period or in the preceding Jemdet Nasr period (Adams 1981: figs. 18 and 21), even though at that time most settlements along its course were of limited size. This suggests that Uruk, the largest and dominant city at the time, must have taken the initiative and provided much of the labor force for the project. City growth and a highly effective, intercommunicating transport network constituted a close and synergistic link, with increases in both wealth and population as dependent variables. Exceptionally effective transport, in short, was central to the “commandandcontrol” architecture of a succession of ascendant, urban-based dynasties in early Mesopotamia. §5.6. I am grateful to Elizabeth Stone for having made available the imagery and associated analytical technology and for much helpful advice on its use. She is currently re-examining the Umma region with this imagery at much larger scales for previously unidentifi ed archaeological sites. They exist by the score, many with unambiguous indications of looting and others as well with extensive indications of ancient surface architecture that will remain very difficult or impossible to date until ground examination becomes possible. It should be noted that the distribution of Stone’s newly located candidate-sites extends uninterruptedly northward across the bed of the Idigna for a considerable distance, strongly suggesting that the Umma province encompassed lands on both banks of this branch of the ancient Tigris. §5.7. The enormous scale and efficiency of poled or towed waterborne transport on the Idigna-Iturungal and other arteries (Adams 2006: 139-142) was almost certainly a decisive factor in the primacy of southern Mesopotamian civilization itself. At the same time, by providing an economical and highly efficient means both to move military forces and to concentrate expropriated resources in the hands of a victorious city or coalition, it must have provided a powerful stimulant to politico-military rivalries. §6.1. Not merely for Umma but for the whole communicating network of cities, the Umma archives supply by far our best records (Steinkeller 2001). Numerous consignments of mixed cargoes, typically in the 25 to as much as 50 ton range per vessel, moved in roundtrip journeys taking up to a month or so around the network of great southern Mesopotamian cities, under the motive power (when not traveling downstream) of a half-dozen or so workmen for each one. §6.2. The variety as well as volume of materials and articles the Umma archive records as in circulation is extraordinary. Beside the staple of barley, an incomplete listing includes processed flour, vegetables, fish, pinewood, roofing beams, beer, bitumen, leather skins and sacks, boats and boat-poles, pottery including pitchers and beer mugs, sesame, dates, caraway seed, almonds, spices, honey, obsidian, perfume, salt, silver, gold, crystal, copper, tin, wooden plowshares and doors, bird plumage, cloth, tile, and enormous quantities of reeds (Sharlach 2003: 29-30, 43, 46-47; Wilcke 2007: 89). Products originating in and exported from the Umma province are impossible to distinguish in a listing like this, although Umma shipping records make reference to very heterogeneous cargoes in addition to primary staples like barley, livestock and reeds. §6.3. Not less than 30 merchants (dam-gar3) can be identified as resident in Umma. Organized in a guild under its own foreman (ugula) and with some self-regulating powers while still embedded in the government, they formed an interesting interface between the official and the secular economy. Their procurement travels took them outside the province with capital supplied by the provincial government, but some of the goods returning to their warehouses entered the local market after supplying government demands (Steinkeller 2004: 102-6). As Dahl observes, if an official account “uses silver as a medium of equivalency, it is likely to be an account concerning a trade-agent” (2003: 22). We learn little of the private aspects of these individuals’ activities from official archives, of course, and can only hope we will one day know more from documents they could well have kept personally if and when some of their homes are found and excavated (cf. Wilcke’s apparent skepticism about formal correctness of their official records). §6.4. Further illustrating the richness of those archives is another kind of survey of Umma’s hinterlands, perhaps more accurately thought of as a gazetteer. Over several decades, while systematically examining almost all of Umma’s 20,000 or so earlier known collections of tablets, Steinkeller (2007: 189) has assembled a list of about 150 settlements mentioned in them. Not even part of the list, moreover, are references to hundreds of individuals in isolated small clusters of dwellings (Steinkeller 2007: 194). The main list ranges upward from tiny hamlets, by far the most numerous category, most of them little more than a threshing floor and a silo. Sometimes but not always mentioned is a small number of dwellings, and occasionally a small shrine. The list scales upward through intermediate categories of towns of varying size, and finally to the city of Umma at the apex. Only a very few of the largest sites that were already included in the Warka Survey can yet be located and named with varying degrees of probability. If there can be a full marshalling of all the relevant textual data, there are good prospects for constructing at least a conceptual, quasi-geographic map of a kind we have for no other ancient Mesopotamian city and its hinterlands. §6.5. In re-examining most of the third millennium sites described in earlier archaeological surveys with the new Digital Globe (DG) imagery, Elizabeth Stone is finding confirmation for the relatively small and isolated sites therein described, and for those noted by Steinkeller. Only for those that have been surveyed and published, of course, can periods of occupation be assigned with any confidence, but in not a few of those thus dated covering a hectare or less in area she reports finding significant architectural information that was not originally visible on the ground. It regularly reflects house-compounds seemingly indistinguishable in size and conformation from those known in excavated urban sites. These appear to be small, clustered sites, not isolated single dwellings (Stone, personal communication) and may reflect im-ri-a or extended family units. §6.6. A further source of information on Umma’s landscape and settlement patterns, beyond the texts and the old survey, may have been the principal stimulus for the Chicago meeting. Digital Globe satellite imagery of very impressive quality has recently become readily available, shedding important new light on the city and area of Umma at the end of the third millennium. Fully geo-rectified and with a pixel size of only 60 cm, this imagery permits highly detailed and exceptionally accurate mapping. It is the base for my new map of the Umma province in figure 1 above, the main objective of which is to illustrate that phase of the historical sequences of hydrological and irrigation patterns. In the virtual absence of useful maps, aerial photograph mosaics and my hand-held prismatic compass were all that the Warka Survey had to rely on. §6.7. The Ur III provincial map depicts a markedly greater density of canalization, and consequently also of settlement and population, along the Iturungal and Idigna in the vicinity of Umma than in the remainder of the province. There is also a progressively more intermittent and meandering quality to subsidiary watercourses as they flowed southeastward. This testifies to widely prevailing, marsh-like conditions and impaired drainage. Noteworthy also is the absence of the dendritic patterns formed by the levees of fully developed irrigation systems. South and southeast from Umma, in other words, it appears both that settlement became more limited and probably transitory, and that agriculture may have been progressively less dominant within broader-spectrum subsistence patterns. §6.8. Taken together, these conditions strongly suggest that there was in this large region a significant component of dispersed marsh settlements, as well as perhaps a smaller number of more permanent mud-brick villages, hamlets, and very few towns. There is ample evidence for frequent movements of the rudimentary shelters made of reed mats composing such settlements in at least the recent past, sometimes reportedly merely to leave behind accumulating vermin. Ochsenschlager’s (2004) ethnographic report, touching secondarily on marsh-dwellers in the vicinity of the recent excavations at nearby ancient Lagash, re-confirms many earlier accounts of the substantial isolation of these populations not only from political authorities but even from adjacent irrigation farmers. §6.9. But isolated did not mean impoverished or lacking in other, variegated resources. Citing an Ur III text recounting dozens of species and hundreds of thousands of collected delicacies, principally birds and bird eggs as well as turtle eggs and tortoises, Postgate (1992: 158) rightly speaks of the marshes as teeming with life. As a preponderant and vital economic resource, however, reeds cut in the marshes probably held pride of place in all manners of construction, shipping, mat-making and container industries. §6.10. The regionally focused concentration of settlement and canalization in the environs of the city of Umma and its Da-Umma quarter of the province, rather than more uniformly dispersed distribution, is striking. It is strongly supported by the allocation of plow-teams to the four provincial quarters by the ensi2’s government. With only slight variation through time, the Da-Umma quarter accounts for about sixty of these teams. To the northeast lay Apisala, the second largest city, with twenty teams, so heavily represented in the Umma archives that the capital may have kept control of its affairs. The quarters of Guedina and Mušbiana, to the southeast and southwest, had a total of just twenty teams for both together (Maekawa 1987, referring to BM 110116). This tends to confirm the pattern of contrastive density within the province as a whole that I identified earlier. §6.11. Potentially disturbing consequences for archaeological theorizing come from the richness of Umma’s archives. Tying character and complexity solely to size of site, which can often be the only evidence produced by settlement pattern surveys, tends to produce a one-dimensional picture of ancient urban centers and their dependencies. But in the Umma province, with so much known from cuneiform text about some of the towns below the apex of the urban hierarchy, we are often able to identify them with what turn out to be their own distinctive, even dominant features. §6.12. Zabalam, for example, seems to have been of little economic importance and to have had a direct royal connection, rather than meeting secular-civic or economic criteria as an urban center. It was visited on apparent pilgrimages for a few successive years by a royal queen (later a dowager queen), coinciding with the presence of one of King Amar-Suen’s sons (of his 31 known children) as the šagina there. Yet it is also possible that there was a hazannu (mayor) in its civil hierarchy (Dahl 2007: 37-41). Through the work of D. I. Owen, Garšana is also known to have been situated in the Umma province (Owen, personal communication, with further reference to an M. Molina publication of Ur III legal texts [forthcoming] proving the same point). It was the source of a collection of more than 1,500 unprovenienced tablets, soon to be published, and was the estate of a princess of the royal family in Ur. Apisala, as already noted, may have been in a special position of administrative dependence on Umma itself. Are archaeologists not in some danger, I find myself asking, of becoming imprisoned in mono-causal explanatory theories through over-reliance on simplistic geometric models that are heavily dependent on narrowly rationalizing economic or administrative variables? §6.13. Umma’s voluminous official records, the products of conscious human agencies, are eloquent reflections of a highly complex administrative system. To deal with them here in a limited but hopefully fairly fundamental way, the barley crop may be the most suitable starting point. It was by all odds the major irrigated crop, the ubiquitous means of remuneration for all forms of labor service, and the standard of exchange for balancing official accounts and acquiring or selling commodities. Although the state made heavy, direct demands for labor services and for a long list of other commodities, barley was at the head of the list in Umma’s annual payment in what seems to have been the monthly sequence of bala tax submissions to the royal dynasty. Tonia Sharlach, who has devoted a primary study to these payments, maintains that slightly less than half of the gross harvest from Umma’s provincial domain lands moved in large consignments by barge, often indirectly through the royal entrepôt at PuzrišDagan but ultimately to the empire’s major urban centers of consumption and expenditure in Ur, Uruk and Nippur (Sharlach 2003: 27, 161). There is some dispute as to whether the cuneiform source to which this is attributed is an original and genuine record or a scribal school copy, leaving open to dispute as well whether the claimed extraction as bala tax of 48 percent or so for the total domain barley crop is correct. §7.1. The Umma archive’s many relevant records attests to only modest variability over reported aggregates. The recorded area of what is characterized as provincial domain land cultivated for barley, under the direct control of the ensi2, is generally given as about 785 bur3 (4,984 hectares). Held in reserve for alternate years in fallow was the same amount. Allotment land was also part of the domain, amounting to 680 bur3 (4,318 ha.). This was apportioned (without right of alienation) as šuku in return for alternate months of corvée service by a relatively privileged, presumably quite limited, but presently inestimable part of the population designated as guruš or erin2. §7.2. The limited scale of cultivated land in the province, at least as recorded in the archive, must be emphasized. Even allowing for fields held in fallow, out of an approximate total area of 2,000 km2 only about 127 km2 or 7 percent (Dahl 2007: 36) were recorded as in use. If we posit that there were probably ten or a dozen primary canals in use that drew their water supply from the Idigna or the Iturungal, it would follow that as little as ten kilometers or so of their individual lengths (not necessarily continuously) were all that would be needed. Along each bank, furthermore, the area actually cultivated would not need to exceed a half-kilometer or so in depth. The relatively modest total water withdrawals needed for this limited area may help to account for the near-invisibility of deep secondary and tertiary canalization. But this could have been complemented in some cases by the use of manual, heavily leveraged lifting devices like those employed along the larger, deeper bed of the Idigna (according to Steinkeller 2001: 29, with up to 300-liter vessels). §7.3. It is very likely that the preoccupation in the records with land designated as the provincial domain is misleading. That artificial construct was not (insofar as yet known) given permanent definition by kudurru markers or otherwise inscribed in plot-maps on tablets. This very modest “footprint” of the ensi2’s agricultural administration was served by state-maintained (and irrigation-taxed) canals and watercourses. The domain (in reality, almost certainly a fragmented territory collectively so designated) retained its approximate area throughout the Ur III period. But as a real entity it was surely subject to continuous, informal modification. In particular, its sources of irrigation water did not automatically become fully expended and terminate at its boundaries. Almost always, though with greater seasonal variability, they would have continued much further. §7.4. Unmentioned plots outside the domain could be, and one must assume were, opened up informally to cultivation with or without the connivance of inspecting scribal officials. In most cases this was probably because their productivity was erratic and marginal. Access to irrigation supplies at critical periods, and at sufficient elevation to serve this purpose, was increasingly problematic toward the “tails” of the major canals. In areas grading into marshes and depressions reeds would have been both a costly impediment to cultivation of cereals and a naturally self-propagating and valuable alternative harvest. These were regions encouraging a broad spectrum of subsistence pursuits, in other words, taking advantage of marshy conditions and poor drainage and hence not investing great labor in permanent improvements of irrigation facilities. Given the mix of variable risk and possible inducements to corruption, there is nothing in the carefully specified Ur III cultivation routines suggesting the necessary flexibility to cope with this diversity. §7.5. But beyond this, is it possible that the records make no acknowledgement of these mostly spontaneous extensions in order to avoid imposition of the kingdom’s bala tax levies? At least a degree of collusion by officials might help to explain why the size of the designated domain remained so static. All that can be said at present, however, is that the real limits of irrigated agriculture around Umma are much more likely to be found in the satellite imagery than in the Umma archives. §7.6. Leaving aside the special skills of plowing teams, agricultural labor, often characterized in general as guruš, fell into several distinguishable classes or categories (Studevent-Hickman 2006). The more privileged erin2 enjoyed full rights as members of the community, and had half-time corvée responsibilities granting them daily barley remuneration of two liters during that period. But they were further divided into upper and lower groups. The former, officials and skilled professionals in addition to some privileged cultivators, received the allotments of land for cultivation called šuku, adding substantially to their security and livelihood. The lower group (its proportionate size is uncertain) did not. Markedly less numerous than the erin2—no more than perhaps a fifth at most of the number of the latter that can be recognized in the fairly exhaustive Umma labor rosters covered by Studevent-Hickman (2006)—was a decidedly unprivileged lower status group, UN-il2 or “carriers”. It was tied to full-time employment at a lower daily allowance of only one liter of barley and no šuku land allotment (Steinkeller 2003: 44-45). §7.7. The period of field cultivation lasted seven months in the agricultural calendar, from beginning plowing in the early fall through in-gathering the barley harvest in the late spring. Excluding the harvest itself, we have records of the allocations and division of labor for most of this process. These permit us to determine the number of “man-days” per hectare needed for major categories of work, e.g., planting, harrowing, clodbreaking, etc. (Maekawa 1990: 124, tables 2-7). §7.8. A clearly incomplete total of 19 man-days per hectare excludes unrecorded irrigation time as well as harvest labor (the latter often, perhaps normally, requiring special recruitment efforts). If this applied both to the domain and to the 4-iku (1.4 ha) individual šuku plots, as would seem natural, the latter alone would consume a full month of an individual farmer’s efforts. At critical times, some conflict seems unavoidable between šuku and corvée requirements, particularly if virtually half of domain land output was being drawn off as bala tax for the royal regime. §7.9. Roughly 9,000 ha of barley cultivation (aggregating šuku and domain) under the authority of the ensi2 would in any case have required more than 170,000 man-days at 19 per hectare. This amounts to 24,000 man-days per month, even if evenly divided throughout the seven-month growing season—and the greater part of the effort would have been needed in the early months. If we accept the recorded estimates, there must have been a full-time provincial agricultural workforce of around a thousand or more available during the growing season. With only half-time corvée assignments available, this becomes 2,000 erin2, with their families an additional multiple of from 3 to 5. §7.10. If the agriculturally employed population and their families amounted to 10,000 or so, what further multiple is plausible to take into account of specialized producers of other subsistence crops and domestic animals, officialdom, merchants, craftsmen, and all of their families? Prosopography may one day supply an informed estimate, but not yet. I will shortly put forward a basis for assuming a work-force of 500 devoted to sheep (and goats) alone, and an existing prosopography of the administrative staff for all domestic animals across the two-generation or so duration of the archive includes 379 individuals (Stepien 1996). On these suggestively large—but of course quite inadequate—clues, I am tempted at least to double the enrolled population under the provincial government to 20,000 or so. §7.11. However, we need to recall the apportionment of plow-teams that was mentioned earlier, with a fifth of the provincial total in the Apisala quarter and a mere tenth each in the Guedina and Mušbiana quarters. Assuming that agricultural population and plow-teams paralleled one another, forty percent of the population total worked and presumably resided too distant from Umma to be credited to the Umma quarter. Thus 10,000 or so for Umma becomes only 6,000, with several substantial towns and scores of smaller hamlets further reducing the size of the city of Umma itself. (Lacking data, I am failing to take into account at all a not inconsiderable population, probably concentrated in Umma as the capital, who were explicitly listed as royal followers.) Regrettably, I see no way in the narrowly focused available records to proceed further toward a converging estimate of the “surplus” upon which the ensi2’s government could call for the support of this population and its many other needs. §7.12. The status of women laborers in this system was low, receiving as they did just one liter of grain per day (or sometimes slightly higher). Numbers of such workers are hard to establish, since most women are listed only as geme2 and left anonymous in the records. But it appears that at least the recorded aggregate is only on the order of 500-700, strongly suggesting that a very high proportion of women were primarily engaged in their own subsistence pursuits and resided with their own families. The two primary assignments of those who are recorded were in the milling of grain into different gradations of flour, and in textile weaving establishments entirely devoted to the two most inferior grades of wool (Waetzoldt 1972: 100-102). §7.13. Some degree of apparent interchangeability between the two occupations probably reflects the low status and possible lack of primary importance for either of these specializations in Umma, as does the fact that gangs of women from them were frequently sent off instead into laborious field clearance and other unskilled cultivation tasks (Waetzoldt 1972: 100-102). That, however, surely reflects an unrecorded convergence between institutionally imposed clearance tasks and a requirement of ordinary domestic life. A ubiquitous view in the contemporary Iraqi countryside is of small groups of women returning to their homes along canal levees heavily laden with bundles of dry brush for cooking fires. This is indirect testimony that the women in these gangs must not have been permanently sequestered for the most part in an unfree status (which in any case is hardly consistent with field labor on uncultivated land) but participants in family life. §7.14. Further reflection must be given to the formally full-time labor service of both geme2 and UN-il2. Remuneration levels do not seem to be constant or clearly specified, but fall in the range of 30-40 sila3 per month (cf. Studevent-Hickman 2006: passim). This appears unsustainably low, at least in the long run, and especially so if most of the day had to be devoted to imposed labor requirements. Moreover, we know that women not infrequently made a career of this, bringing their children to work with them until their adolescent years. This leads to the suggestion just made that women in the mill and textile labor force must have lived with and had the support of family members, contributing field gleanings as firewood in addition to their very modest earnings to their families’ collective incomes. §7.15. The apparently limited utilization of women’s labor is in striking, frankly puzzling, contrast to what was occurring simultaneously in the neighboring province of Girsu-Lagash. That was a huge center of high-quality wool textile production, employing in excess of 15,000 individuals, overwhelmingly women (Waetzoldt 1972: 99). Girsu-Lagash was probably 3-4 times larger than Umma in population and area, although its territory remains very vaguely defined. It not only cultivated roughly four times as much barley in spite of having extensive marshes and a large workforce of fishermen, but also supported herds of sheep two and half times larger than Umma’s. Not surprisingly, therefore, it had to meet bala tax obligations for three months annually to Umma’s one. Umma, of course, may well have had a different primary bala assignment, perhaps in reeds as a very valuable and versatile raw material for animal feed and construction, and in many commodities made of reeds. But this needs further study, admirably emphasized recently by Claus Wilcke (2007). §7.16. But next, with the existing texts too laconic to be of much help, what can we surmise about similar problems arising from the status of the UN-il2? They too, I believe, could not sustain themselves living independently. I see only two alternatives, possibly supplementing one another, and both consistent with the fact that, as “menials” or “carriers,” UN-il2 do not seem to be associated with tools suggestive of specified activities. They could be adolescents, not yet capable of a fully adult quotient of labor, a possibility supported by provisions for their special supervision and high rates of imprisonment (Studevent-Hickman 2006: 93-94). On the other hand, then it is odd that there is no reference to individuals transitioning out of the category. Or they might instead be elderly and infirm individuals, of whom less was expected for the same reason. §7.17. If these admittedly speculative possibilities are on the right track, they have the effect of tending to close-off an avenue of entry from below into the provincial community subject to the ensi2’s government, seemingly contrary to the provincial government’s self-interest. But at the moment I am left with this apparent paradox. The lowermost regular status group then were those erin2 who were not entitled to šuku plots. They would have been the ones under greatest pressure to take up subsistence plots of their own along the tails of canals beyond the formal limits of provincial domain land. §7.18. As mentioned earlier, with the UN-il2 not a significant factor in the calculation, meeting the agricultural labor requirements that was previously derived involved the employment of erin2 with half-time corvée responsibilities. And that then had to involve a halftime force of about 2,000. The 680 bur3 (4,318 ha) set aside for šuku plots of 4 iku (1.4 ha) each could, in principle, easily provide for a full 3,000 erin2 with assigned šuku allotments. But, as also noted earlier, the proportion with this benefit is not directly known. And a large other proportion was reserved for higher-status recipients. Those included, for example, 60 bur (381 ha) for the ensi2 alone. Nor is that necessarily a full reflection of an ensi2’s holdings. Another text records the transfer of 11,800 sheep and goats between two of these provincial governors, although this was quite possibly tied to their offices and not their persons (Dahl 2007:61, 70-71). But tables summarizing the array of higher-status perquisites are not in any case available, arguably an ancient example of what today we criticize as “a lack of governmental transparency.” Hence there is no back-door available here to determining the proportion of all erin2 receiving the very substantial benefit of šuku allotments. §7.19. I should also briefly summarize here what can be said of other categories of land use in Umma, outside of the designated domain. These also do not appear in comprehensive listings but only as records of individual transactions. Hence it is very difficult to assess their overall importance. Urban house-plots had been privately held and freely alienable for centuries. Palm orchards, similarly, were in private hands, quite possibly reflecting their special summer watering requirements outside of the normal irrigation season. Another factor may have been the value of their output of dates per land unit. Vegetable gardening, similarly, was on privately held land, no doubt also reflecting the hand-cultivation attention it required. These products circulated widely without state oversight. Larger plots of land were rented for cultivation, not from the domain but probably from the old land-holdings of traditional temples. §7.20. While the temples continued to appear as possible focuses of individual attachment from time to time, their staffs are otherwise little in evidence as active, decision-making officials. They did, however, lease out lands that were under their control (Steinkeller 1981: 121). I am not aware of sources containing multiple records of rented land, and infrequent individual references suggest that it may have been relatively minor in proportion to other uses. Still, if a relatively nearby, uncommitted labor-force of cultivators was available for hired, private employment on non-state land, it may turn out that this was an avenue of wealth-seeking investment for elites. §8.1. The picture that emerges of the Umma ensi2’s own provincial constituency is that it was of moderate overall size but at the same time very clearly stratified. Unfortunately, even relative proportions of the different status categories, as distinguished from rough numerical estimates, are not yet available. The subject cries out for serious, large-scale prosopography, without which the steep-sidedness of the decline in numbers to be expected with progressively higher income levels remains altogether elusive. Moreover, some categories of wealth and well-being—to begin with, what size and shape of a hierarchy of officialdom must have been needed to generate some multiple of 20,000 known tablets in a 45-year period? But many other informative indices are even harder to calculate: the areas and furnishings of private dwellings, merchants’ and craftsmen’s incomes coincident with their official duties, income from land rental and from the foreclosure of loans with šuku holdings as security, to name but the most obvious. Conscious capital investment in wealth-producing ventures also seems not unlikely. Coupling effective management and supplemental irrigation with lifting devices, field rental in the neighboring Girsu-Lagash province appears to have been the source of very considerable private profit (Maekawa 1986: 122-229). §8.2. Note was taken earlier of the troubling paradox of an apparent absence of measures for encouraging the immigration of a stream of families or individuals to augment the labor force and expand both its agricultural and proto-industrial base. Dependent on military successes in frontier regions, to be sure, some of this was achieved at the imperial level. But a growing labor base would have invigorated the whole economy. And I have argued that there probably were at least modest population elements beyond the reach of its developed agricultural lands, engaged in less intensive subsistence activities and participating only marginally in its way of life. How attractive or unattractive would the prospect of closer integration have appeared to those outside it? §8.3. Conditions of life and work at the base of the economy were clearly harshly regulated in many respects. As the most comprehensive study of the labor system recently reported, their lives were extremely difficult, as reflected in two phenomena: illness and incarceration. “UN-il2 and geme2 were routinely incapacitated, in some cases for over a year, and death was often the final result…. Prison sentences for the UN-il2 and geme2 workers are very common, reflecting the fact that they routinely fled their work obligations” (Studevent-Hickman 2006: 100; cf. Dahl 2003: 80-81). §8.4. Supporting this impression, Dahl reports that “we are in possession of a substantial number of texts testifying to the many escapes from the Ur III state, occasionally brought back to the state and enrolled in the production anew.” Yet there is no evidence “for any punishment of a foreman for losing large numbers of his crew” (Dahl 2003: 80-81). On the other hand, a well-informed CDLI reviewer of this study remarks that “regular bands of ‘slave catchers’” were also known. Were those escaping private slaves, a never very numerous group, or erin2 without šuku allotments seeking an escape from corvée assignments and a less regimented life? §8.5. This is an important but murky area on which it is difficult to reach a coherent view. That the number of escapees or “economic emigrants” was considerably larger than the number returned seems widely agreed upon but not quantitatively established. Would there have been no move toward encouraging a countervailing flow, other than to hope for captured prisoners from foreign campaigns? I find that hard (but not impossible) to believe. There was, after all, a reservoir of labor that was steadier and nearer at hand. Driven by insecurity or many forms of uncontrollable environmental variation, would there not always have been a basis for a counterflow seeking their way into the orbit of the city and the certainties of the regulated life that it imposed? §8.6. To be mentioned in this respect is a fairly prominent category of other, anonymous employees often translated as “hirelings” (lu2 hun-ga2) who received six or seven times that lower-most daily rate of a liter of barley (Steinkeller 2002: 119, Dahl 2003: 57). That remarkable wage level would indeed attract eager candidates for employment from throughout the surrounding area, quickly filling any need in the event of a sudden shortfall. That it was in fairly extensive use, with no suggestion of attachment to special sets of skills, also suggests that it could have been a regular recruitment device to attract potential earners of regular wages. §8.7. Two well-recorded aspects of working life lend confirmation to the existence of a real, adjacent and substantial labor reservoir. The first is the sheep-raising and wool-producing industry, my initial point of entry into the Umma economy (Adams 2006). I observed then that the temporary, month-long cycles of mustering unskilled corvée labor were a wholly unsuitable and ineffective way to recruit staffs with the appropriate skills and local knowledge to form the labor force required to maintain the herds. After all, wool, their principle by-product was the indispensable raw material for the giant Ur III textile industry, the largest, most valuable, most crucial input for the empire’s long-distance trade (as well as for the official elite’s own sumptuary requirements). Yet the very substantial records covering this industry include references only to the individual, shepherd-supervisors (79 in total number, across the two-generation duration of the archive), and nothing at all on how they were assisted (Adams 2006: 150). §8.8. From a record of the ensi2’s total annual wool intake it can be concluded that Umma’s herds included about 25,000 sheep (Dahl 2007: 88-90) and thus— especially remembering that lions were the principal predators!—must have required 500 or more adult, fulltime herdsmen. Where did all these unrecorded people come from? How could they be missing entirely in the one genuinely prosopographic study we yet have of a whole sector (animal husbandry) of productive activity (Stepien 1996)? Herding in marshes or steppes apparently took it beyond the bounds of both imperial control and perception. §8.9. Presumably they were recruited directly by the shepherds themselves. This clearly implies the existence of a widely prevailing pattern of labor recruitment applying to population elements in the Umma region beyond those who were officially regarded as regular members of the system itself. How this was directly or indirectly funded by the state, as in the end it must have been, is at present entirely obscure. The small number of shepherd-foremen identified in the records, traveling back and forth frequently to attend to reports and formalities in Umma offices, could hardly have been effective day-to-day supervisors of field activities. As will be described near the end of this article, there is even reason to wonder about the effectiveness and even existence of their purported annual or semi-annual enumerations and inspections. For all of the vaunted system of Ur III records, herding of sheep and goats may have been fairly close to a detached sub-contracting operation. §8.10. The second confirmatory example is directly connected with Ur III agriculture. We have a widely copied ancient handbook on Sumerian agriculture, “The Farmer’s Instructions” (Civil 1994). In it an “Old Man Tiller” instructs his son on the demands of the position the latter would one day fill, a position that is almost exactly what would be expected of engar similarly acting as supervisors of the plow-teams I mentioned earlier. This position, too, was actively supervisory of assistants who were designated in the instructions only as “helpers,” and in whose selection and assignments the supervisor appears to have had largely independent discretion: “Keep your eye on the man who drops the seed”; “Gather a sufficient number for your force of helpers and grain gatherers”; “your threshers should be strong”; “put an intelligent person as your second winnower” (ibid., 33); etc. Nothing is said in this about the status or support system for these helpers, and there is also no hint that they were simply assigned to the engar-farmer by another component of the administrative system. Does this not strongly support the likelihood of a peripheral category of part-time participants in the labor system who simply fell below the formal threshold of official recognition? §8.11. I would avoid using the term “class” as an overdrawn characterization of Umma’s multi-level stratification system. Details of wealth and the distribution of power, both within the province and at the imperial level, remain too elusive for this. Particularly difficult to take into account is the dynastic regime’s voracious capacity for extracting natural resources, the products of agriculture and animal husbandry, and human labor, and siphoning most of this away to the vicinities of Nippur, Uruk and Ur. One could argue, however, that within the Umma province itself a fairly wide circle of graded privileges extended down from the ensi2 through at least the level of šuku-holding erin2. Might this have been allowed to develop in part to assure the loyalty of a (modestly benefited) core of the provincial population? §8.12. But it is important not to overstate the incipient, contrastive existence of a “core” and a “periphery” within a single, local setting into the assumption that there would have been a formally maintained microboundary between them. In most respects an irregular continuum seems more likely. Moreover, if there were pastoralists, marsh-dwellers, and other marginal elements in at least periodic contact, it seems virtually certain that some of them would find it attractive to penetrate into the lowermost stratum of provincial and urban life itself. There they could have filled the traditional urban role of unrecognized underclass, evading formal institutional or civic structures and living by their wits. We simply do not come anywhere near knowing enough to draw a proper balance between the credits and debits of participation in the provincial government’s realm of control as they would have been perceived by different status groups in the population. §8.13. Would security have been an ongoing problem in the outlying, more sparsely populated countryside? How far would the provincial government have dipped into its reserves to smooth episodes of subsistence volatility for less and less privileged levels of its own supporters? To what extent did some kind of infrastructure of irrigation agriculture with carefully maintained, upstream intakes result in benefits to the upper tiers? Were there other differential advantages to urban centrality, such as occasional access to meat and dairy products (e.g., feast days, or after sacrificial ceremonies in temples), greater availability of non-home-produced consumables, and of course the spiritual protection of local deities? None of these obvious possibilities has received much notice in written records. §8.14. The declining density as we turn from more urbanized parts of the settlement system toward the south and southeast has many parallels in later historical and recent times, with successively more predatory imperial regimes tending to generate more and more determined resistance. Historical illustrations include the stubborn persistence of Babylonian resistance to the Neo-Assyrian empire in the southernmost alluvium, and, in marvelous, yet-to-be adequately analyzed detail, al-Tabari’s classic account (Waines 1992) of the lengthy, only barely suppressed revolt of the largely marsh-dwelling “Zanj” (869-879 AD). The remote and ephemeral, and yet exceptionally well-adapted, quality of this way of life has repeatedly made it a relatively independent and secure refuge. Dissidents and army deserters in recent decades flocked there for the same reason. The only effective way the Iraqi Ba’ath regime found to deal with them went to the extreme of attempting the elimination of the marshes themselves. §8.15. Apart from contributing to the detection of trends and discontinuities, the prevailing pattern of land use evident in the imagery for the southern alluvium in the late third millennium is heterogeneous rather than all-inclusive. No extended layouts of dendritic irrigation systems are in evidence, on the model of those that came to characterize the Mesopotamian plain two and a half millennia later. Instead there was a patchwork of urban-centered zones of varying size along connective but often narrow canal or river-branch corridors, and zones of irrigated agriculture, apparently interspersed with marsh and steppe deemed difficult or unsuitable (sometimes too saline) to justify irrigating that were left or set aside for less settled and intensive irrigators with a broad and resilient array of other pursuits and subsistence patterns (Adams 1978). … throughout early Mesopotamian history we are dealing not with successive waves of nomadic groups from some putative ultimate homeland, but with differing modes of interaction with population groups which consisted of a variety of elements, some settled, some in various nomadic patternings, some newly arrived and some which had lived in the area for generations. Moreover, one must posit that the varieties of social and economic forms under which these people lived provided the occasion for successive forms of intermingling between those who were from the periphery and those who had arrived from the center (Michalowski 1983: 244-245). §8.17. The ancient cities of the lower Mesopotamian alluvium, in other words, were radiating centers of economic attraction for long periods, and more fitfully, of successive shifts of political power among them. The vital riverine transport network linking them focused their energies inward on their intense, reciprocal relations, exacting from and exchanging with one another fungible surpluses of widely usable commodities, rather than on the more variegated and dispersed products and less controllable or sedentized peoples associated with steppe and marshes. §8.18. But if the latter only sporadically came within the perimeters of urban/provincial perception and control, a more integrated view of the region as a whole defines it better as a mosaic composed of tiles with shifting, porous boundaries. Officials, scribes, merchants, craftsmen and persons of influence or wealth might move from city to city following dynastic succession— a process our ancient Mesopotamian sources may not illuminate but that we also cannot believe was not commonplace. But the flows of lower-status folk were more likely to oscillate inward and outward along a settled-unsettled continuum. If the weight of a dominant dynastic capital’s claims on its subordinated rivals became increasingly onerous, that outward flow of the least-favored workforce might anticipate, and thus accelerate, the onset of a crisis leading to a dynastic succession. When it came in Umma, very early in the reign of Ibbi-Suen and many years before his final downfall, new entries in the great Umma administrative archive ceased altogether. Absent a written record, clarification of these dynamics of collapse will be an archaeological challenge, made immensely difficult by the increasingly evident local, human-influenced complexity of alluvial deposition and aeolian deflation. §8.19. Briefly then, at least as suggested by a convergence of the topography, hydrology, settlement data, and archival sources for the province of Umma, the evidence is not supportive of a region wholly given over to intensive irrigation agriculture. It testifies instead to a much more differentiated, less consistently developed pattern, with limitations implied also for the constancy and evenness of penetration of either provincial or royal authority into the more remote countryside. No small part of the aggregate population apparently fell outside urban horizons of perception. §9. How many Ummaites were there? §9.1. Lurking in the background throughout this discussion has been uncertainty over the aggregate size of the population of the Umma province. To be honest, in some respects it now seems little closer and perhaps more distant from serious estimation than it appeared to be at the time of the Warka Survey’s brief venture into the region four decades ago. For not all “progress” on basic issues of demography is irreversibly in a forward direction. Large excavated areas in early sites in the southern Mesopotamian alluvium are exceedingly rare, and such exposures are even rarer in the very few small settlements that have drawn archaeological attention at all. Demographic projections based on survey data have tended, therefore, to rely on questionable average densities that were derived partly from relatively tiny excavated exposures and partly from modern settlements. Nicholas Postgate, a participant in the winter 2007 meeting, who re-examined this issue in an important 1994 paper, heavily discounted the notion of a single average density figure and made a strong case for the existence of a four-fold range of variation (specifically from 248 to 1,204 inhabitants per hectare) (1994: 64) on the basis of excavated data alone. While the evidentiary base from excavated sites remains slim, to say the least, it may expand with the surface architectural traces that Stone is recovering (although how far they are relevant to the 3rd and 2nd millennia, as opposed to more recent periods, remains to be determined). §9.2. The radically declining utility of non-systematic archaeological surveys, and within them of site-areas as convenient, one-stop population indices, may be the most significant reasons for taking a serious step backwards. New satellite imagery is also multiplying by several times the number of suspected sites on whose times of residence or some form of use we have no information. Ambiguities arising from new knowledge of the complex dynamics of the land surface add still further uncertainties to attempts to count numbers and then form coherent size-categories of settlements below the level of what were truly urban centers. The new imagery also adds materially to what was known from excavations, in the form of observable surface areas of ancient architectural exposure. It is also disclosing unexpectedly wide variability in the density of residential use within site limits. New methodologies have been introduced and tested, greatly extending what can be learned of the extent and nature of irrigation systems, from remote satellites or on the ground. The further uncertainties as landscape archaeology has matured as a discipline now multiply this yet again. §9.3. But some real numbers have been introduced by beginning at the other end, with Umma’s recorded agricultural labor requirements and approximations for a few other, smaller employment categories. Specifically, there appears to have been a provincial labor-force on the order of 2,000 that was primarily engaged (during the seven-month growing season) in irrigated field agriculture. But let us consider further what multiple is reasonable if we wish to take into account craftsmen, merchants, the large body of officials, the occasional dispatch of very large bodies of corvée laborers for lengthy periods of service elsewhere in the empire, and not least, for the families of all of the above? On the admittedly slender basis of inferences I have tried to outline, the population of the city of Umma alone appears not to have been much in excess of 15,000 to 20,000 or so at most, with a considerably smaller number in subordinate towns and villages or hamlets. As to the unreported population stratum mentioned earlier engaged in a more variegated range of, collecting, extractive, and smaller-scale agricultural activities in the hinterlands, little more than a guess at this point would be at around a tenth of this number. And for the unknown number of garrisons and royal estates, some of the latter possibly of very considerable size, that were scattered throughout the province, we must await further familiarization with Piotr Steinkeller’s reported sources before hazarding a guess. §9.4. Specifically turning to the city of Umma, Adams and Nissen estimated the size of the elevated area of the site to be 1,500 meters in diameter (1972: site 197). 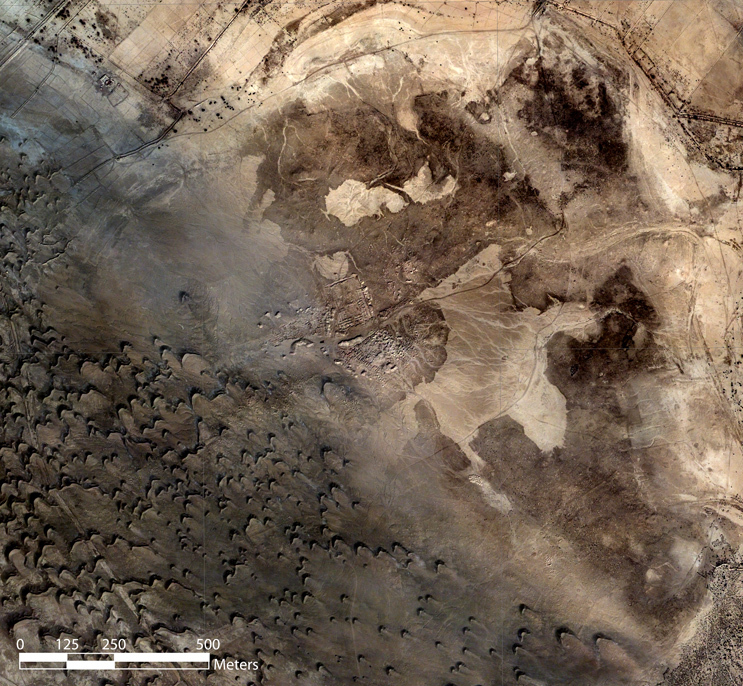 Absent elevation data, site limits are not evident in a new and remarkable satellite image (figure 2), but at higher resolution can be roughly defined by the perimeters of recent clandestine digging. The heavy overlay of dunes makes this subject to considerable error, but if one assumes that an area if this size was uniformly occupied by 20,000 people its density would have been about 113 persons per hectare. The large harbor, perhaps 14 ha in extent, that is visible in the satellite imagery and the suggestion of unoccupied central space accompanying public buildings there immediately elevate this densite estimate for residential areas. And it seems reasonable to assume that there were areas, probably concentrated near the harbor, with storehouses and industrial and shipping facilities, and a market-place, rather than residences. On the other hand, as I recall rapidly growing Baghdad in the 1950s and 1960s before the era of ballooning oil revenues, there were also dense slums in the outskirts built mainly of sarifa (reed) mats. Might that pattern elevate the population density even more with part-time or temporary inhabitants (possibly living outside a city wall)? The dynamics of ancient city planning looms as a field of study that one day will be on the agenda of Mesopotamian archaeologists. §9.5. In the long run, the textual prospects clearly offer greatest hope. But it also becomes ever-clearer that we cannot reasonably expect a widening of the range of observation or concern, on the part of the scribes responsible for our archives, beyond their narrowly assigned fields of competence and view. It will rest with the Sumerologists themselves to expand their frames of reference beyond the individual categories or examples of their usual recording practice, in order to probe innovatively for clues into the almost unmentioned population beyond. §9.6. Prosopography will be the key approach in this effort, but only if applied to broadly inclusive categories of labor cadres or status groups, and also with ambiguities reduced by incorporating the evidence of sealings with that of the texts themselves. Sooner or later, as the evidentiary base expands, calculations of necessary dietary intake for given population levels may become a cross-check on crop yields. Ultimately, when peace returns to Iraq, all this would best be part of an interdisciplinary effort in which archaeological findings, in streets of residences rather than just temples and palaces, simultaneously begin to bring out in detail the material remains of large-scale secular behavior that currently remain hidden in the mist. §10.1. The larger purposes of Umma’s vast archive resist easy explanation, but they do suggest the need for supplementing the descriptive contents of the cuneiform texts themselves with a more contextual approach to their purposes and utility. Many small tablets are seemingly transitory records of particular micro-transactions. Why were they archived at all? Others, certainly far more important to us, are large “balanced accounts,” so meticulous in preparation and complex in content as to make evident a permanent need for them. Kept in an Umma archive rather than sent to a royal repository in Ur, they testify to local rather than dynastic utility, although perhaps in responding to inquiries from royal overseers. §10.2. Piotr Steinkeller, deeply familiar with this conundrum of uncertain use, is in no doubt that at least the more important texts were for the use of “top management” concerned with forward planning. “This system called for an extraordinarily high level of data recording, since the provincial administration had to know exactly how much goods and labor it expended on behalf of the central government and its officialdom in order to be able to calculate the value of its contributions vis-ˆ-vis the figure that had been assessed for the province” (2004: 80-83). At the same time, he concedes that “the overwhelming majority of administrative documents were written post factum” and that “probably as a general rule—within individual components of the system information was gathered, processed, stored, and consulted without recourse to writing.” This leads him to the arresting conclusion that “one could say, therefore, that the administrative records operate within a kind of ‘accounting reality’ or even ‘accounting fiction’” (ibid, pp. 74, 77). §10.3. This is welcome candor, but it describes an essentially defensive rationale against the intervention of future royal overseers. Left open is the degree of real utility for provincial planning—let alone royal scrutiny. And in this respect, it is very difficult to visualize circumstances in which most of these records could serve as effective tools of future management. Accounts offered in wholly artificial “man-days,” for example, could not be retrofitted to provide helpful details on how to plan for the exigencies of the actual activities they purported to record. §10.4. The general anonymity of labor records with regard to what were clearly regarded as inferior categories, UN-il2 and geme2 in particular, also deserves some further thought. To be sure, this would greatly simplify the record-keeping process (perhaps just the ugula’s memory?) at the time of the initial activity. But why was there no need for retained accountability for these persons? Possibly it implies that punishments (there is no reference to a system of rewards) were imposed instantly by the supervisor, with no prospect of appeal to a higher authority. But then repeated offenses, or countermeasures following worker flight, would be hampered by the fallible memory of one in a pool of supervisors. And it is abundantly clear in Studevent-Hickman’s accounting of voluminous details of Umma labor management that there were repeated, essentially pragmatic shifts in management that would interrupt the tie of any particular supervisor to a particular work crew. §10.5. If there was utility within Umma itself, as distinguished from defending against royal auditors, perhaps defensiveness was still the primary objective. Whether real or fictional, the routing did permanently document a formal line of transfers of responsibility from one named person or office to another. Within a prescribed set of procedures, the responsibility for what was perceived as success or failure could be attributed to an office and person in the usual terms of credits or debits. The former might provide a basis for appointment or promotion, the latter for something far worse. §10.6. We know (particularly from Englund 1991) that very harsh penalties were sometimes imposed on ugula (and after their deaths, their families) for the failure of their corvée and other work-crews to meet performance standards set at high, possibly unrealistic levels. It would certainly be plausible for reviews of archived documents to play a role in later decisions on appointment and promotions as well. I am not aware that the existence of such a routine review process of any kind has been identified, but it is surely a possibility and even a likelihood. §10.7. If that loomed as a distinct possibility to lower-level actors in the system, this would have consequences for the entries on the tablets. Particularly since what was being written were post factum recapitulations, it was more important that entries be neat, consistent with one another, and non-revelatory of difficulties that would catch the attention of higher levels of administration than that they be accurate. §10.8. Thus we come to recognize a system of Ur III book-keeping practices very different from those we (at least ideally) would expect today. The re-calculation of expenditures into artificial terms of individualized “man-days,” or of services and commodities into standardized units of barley, reaffirmed the goals and constraints of the system itself. And the detachment from real performance in that system was not particularly relevant if the assignment of personal responsibility was its primary objective. §10.9. The degree of realism in agricultural records is subject to similar considerations. Puzzlingly high rates of barley crop yield (by medieval or contemporary third-world standards) can be tentatively attributed to the use of seed-drill plowing, to widely spaced furrows rather than broadcast sowing, and to an advanced sense of field management during the growing season. Giving further benefit of the doubt, yields could also have been raised by the well-recorded Ur III attention to the manicuring of field surfaces with clod-breaking and repeated harrowing. Moreover, the records were at least honest enough to make clear that the sought-for standard of “30 gur per bur3” (ca. 1500 liters/hectare, an idealized 30-for-one multiple of yield-over-seed proportion) was on the order of 50 percent (and very often more) above what was ordinarily achieved. But still very difficult to understand is the apparent reliance on pre-harvest, “by-eye” yield estimates, as opposed to intake-figures as actual harvests were received at government granaries. Nor have I seen any plausible explanation of why there is nothing suggesting any interest in later corrections or in recording actual granary levels at later dates. §11.1. Perhaps one might conclude from this that the intention was simply to impose a sense of all-seeing discipline on a less than enthusiastic work-force, who after all would never know the aggregate and corrected figures anyway. That is certainly consistent with the rigorous enforcement of harsh penalties on ugula that were mentioned earlier. But none of this provides a really satisfactory justification for the larger functionality of the entire accounting system. Are there any known instances in which some administrator looked at demonstrably older tablets for some performance-related or at least quantitative-economic reason? Were any numbers generated in Umma, and more particularly numbers that seem to have been corrections of earlier ones, ever sent to Ur? In the absence of the type of correspondence currently known only from later periods, have any records ever been found implying the questioning of past details or suggesting concern about local difficulties or even the size and timing of forthcoming deliveries? §11.2. In the end, however, I am driven to conclude that attempts to arrive at an understanding of the “larger functionality,” let alone “cost-effectiveness,” of the system in terms of standards of accuracy and utility for timely planning, are for the most part a modern anachronism. Particularly for domestic stock-breeding, Mario Liverani and Wolfgang Heimpel have jointly offered the intuitively compelling explanation that offsetting “unrealistic” assumptions—e.g., ewes that never die, but that also produce only half the expected annual number of lambs in ideally equal male and female proportions— will in normal circumstances produce good approximate results: “so the text says not what really happened but what the administration pretended had to happen.” And they go on to show that conveniently counterbalancing falsifications like these originated in the earliest archaic writing from Uruk late in the fourth millennium BC and persisted until the final disappearance of cuneiform writing more than three millennia later. Somewhat too charitably, Liverani suggests only that this could happen “in the recording of a commodity which was not under direct control.” Virtually permanently, in other words, a much more sedentary canonical falsification was deemed just as officially acceptable as an arduous accurate enumeration (Liverani and Heimpel 1995: 128-29 and passim). Of course, that leaves open the question of how adjustments were made when normality was interrupted or when harvest variability made the very idea of normality a figment of the imagination. §11.3. In human history, it may be only the very long-term ossification of this pattern that is really surprising. Could it not be a bureaucratic norm, ancient or modern, to address large uncertainties only slowly and indirectly while dealing with each pattern-breaking crisis as sui generis? Fascinating recent work on the origins of double-entry book-keeping in fourteenth-century Florence, with many obvious parallels to Ur III balanced accounts, has suggested that private banking finances there were really based instead on strong inter-familial bonds of trust. The potential of double-entry book-keeping as an abstract and absolute standard of verifiability was a rationale that was not initially apparent and was only added later (Padgett and McLean 2006). I am deeply indebted to anthropological archaeologist Henry Wright, and to the CDLJ reviewers and editors for critical comments on drafts of this paper. One of many such drafts received a first public reading in October 2007 at the Museum of Anthropology of the University of Michigan. bur3 land measurement unit, 6.35 ha. iku land unit, 1/18 of bur, 0.35 ha. 1975 “Some Old Babylonian Shepherds and their fl ocks,” JSS 20, 1-21. 1994 “How many Sumerians per Hectare?—Probing the Anatomy of an Early City,” Cambridge Archaeological Journal 4, 47-65. 1972 Untersuchungen zur neusumerischen Testilindustrie. Studi Economici e Tecnologici 1. Rome: Centro per le Antichita e la Storia dell’Arte Vicino Oriente.